LastBoks® is the last truck bed storage solution you will ever need. LastBoks® outperforms the Cargo Sling by Truxedo by protecting your truck bed from liquids better than any other product on the market. Ease of access is key during a tough work day, LastBoks® makes life simple by pulling out on to the tailgate for quick access unlike the Bed Extender by AMP. 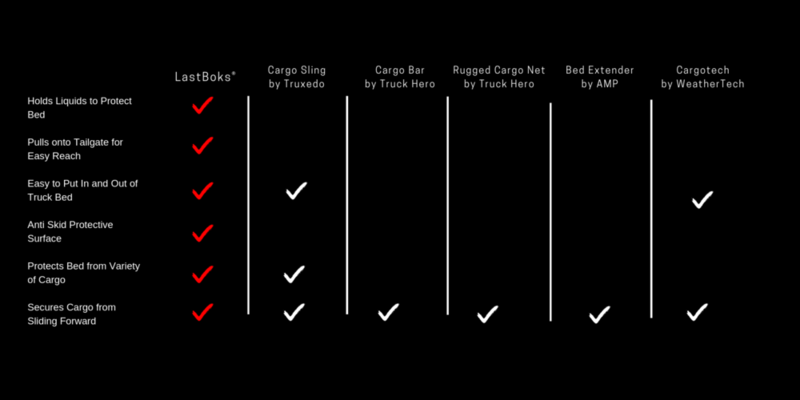 LastBoks® also features some of the fastest install and removal as compared to competitors like the Cargo Bar by Truck Hero. LastBoks® anti-skid protective surface will keep you safer when accessing your truck, and will protect your truck bed from cargo better than Cargotech by WeatherTech or the Rugged Cargo Net by Truck Hero. LastBoks® is the perfect product for General Motors drivers, and will fit your GMC Sierra 1500 or Sierra HD 2500, or if you prefer Chevrolet, your Chevy Silverado 1500, 2500HD, or 3500HD. For other American truck buyers, LastBoks® will fit your Dodge Ram 1500, 2500, or 3500, or your Ford F-150 Super Duty or Raptor. Finally, for fans of foreign made trucks, LastBoks® will be the perfect match for a Toyota Tundra, or Nisson Titan and Titan XD models.